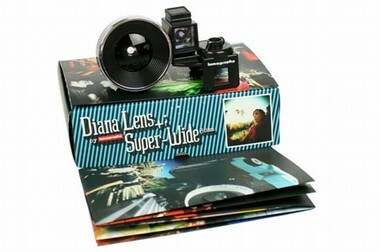 1Exklusiv für die Diana+ designed ist die Super Wide Linse. Ermöglicht 120° Aufnahmen! A full-frame treat for the wide-angle connoisseur. Imagine taking that Diana+ image that you know and love, letting in a ton of new info and content from all around your head (including a lot that your eyes cannot see) and s-t-r-e-t-c-h-i-n-g it all out to the very corners of your frame. Roughly equivalent to a 25mm lens on a standard 35mm camera (a yielding a 120° View Angle), this classic super-wide perspective is a favorite of street photographers and photojournalists the world over. And for good reasons! Close subjects assume an in-your-face urgency (and slightly stretched out noses). City and country-scapes take on a sweeping and grandiose air. The dreamy look and feel of the classic Diana+ image is fully maintained, with signature darkening and a bit of blurriness at the corners. Includes accessory viewfinder, viewfinder mount, and lens caps.